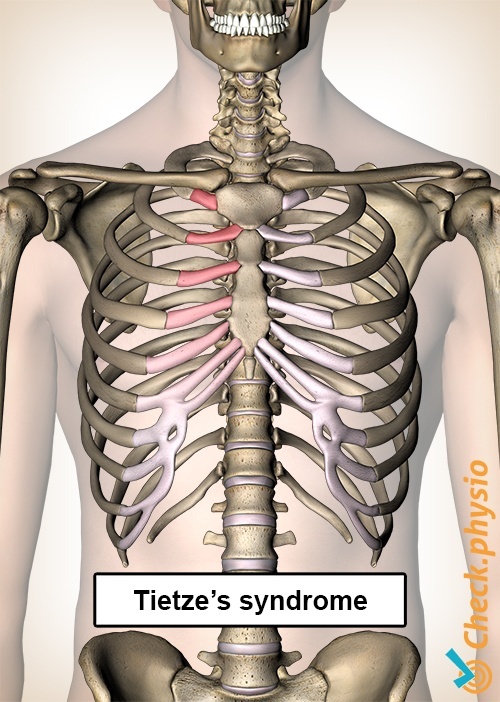 Tietze's syndrome is a condition that causes inflammation of the cartilage connections between one or more ribs and the breastbone. This results in annoying pain on the chest, which will sometimes feel as if there is something wrong with the heart. Tietze's syndrome is a relatively unknown rheumatic condition. As the symptoms caused by the condition are sometimes similar to a heart attack, it is very important to have a specialist evaluate the symptoms. 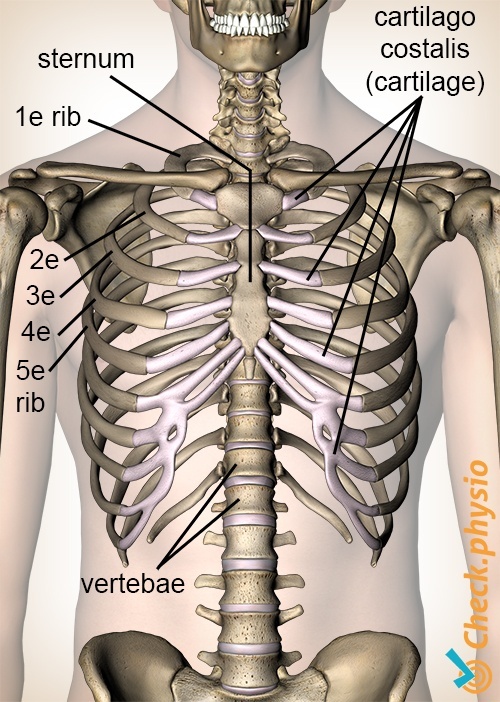 Along the front of the body, the chest (rib cage) is formed by the ribs, the breastbone and a number of vertebrae. The ribs are connected to the breastbone via cartilage structures. These cartilage structures, called "costal cartilage", provide the ribs with some room to move and allow the rib cage to expand and contract. If the cartilage is inflamed between one or more ribs and when the breastbone and swelling of the cartilage also occurs, this is referred to as Tietze's syndrome. If there is no swelling, or if the cartilage along the back side of the ribs is inflamed, this is referred to as costochondritis. Incorrect posture (for example, a stooped posture with rounded back and shoulders protruding forwards). Overloading or trauma (for example, falling or bumping the chest). Repetitive movements that cause the rib cage to expand, exerting forces on the cartilage of the ribs (for example, deep inhalation, lots of coughing or repeated clearing of the throat). It is thought that people with a family history of rheumatic conditions have an increased risk of developing Tietze's syndrome. Other factors that result in an increased risk include: postural abnormalities, limited muscle strength, fear of movement and a low capacity. Pain on the chest at the level of the breastbone. The pain can be sharp in nature and occur in waves. The skin above the inflammation can be red. Pressure pain over the inflamed cartilage. Coughing, sneezing or deep inhalation is extra painful. Sometimes the pain can radiate to the ribs, the arm, the shoulder or the abdomen. Movements of the upper body place extra pressure or tractive forces on the ribs and the cartilage. This can make the pain worse. The rib cage also moves along with the arm movements that we make. Therefore, certain arm movements can provoke the symptoms. The diagnosis is made according to the physical examination and the patient's story. Blood tests often do not reveal any abnormalities. X-rays of patients with Tietze's syndrome reveal swelling at the base of the breastbone. As no real treatment has been found yet for the condition, the treatment is often aimed at reducing the pain. Patients are therefore prescribed analgesics or anti-inflammatories. Sometimes injections are administered at the site of the inflammation. The symptoms usually disappear on their own within several months. However, the condition can become chronic, causing problems for months or years. Sometimes the symptoms never go away completely. The physiotherapist helps to achieve improved posture. This reduces the pressure on the painful cartilage connections. Other techniques include stretching of the pectoralis major muscle and strengthening of the rhomboid muscles located between the shoulder blades. Relaxation exercises and breathing exercises can also have added value.